Combine ketchup, mayonnaise, and chile paste. Mix beef with 1 teaspoon salt and 1/2 teaspoon pepper, then form into 4 (4 1/4-inch-diameter) patties. Lightly toast rolls on grill. Pat pineapple dry and brush with 1/2 tablespoon oil. Oil grill rack, then grill pineapple and burgers, covered only if using a gas grill, turning once, until pineapple is tender and caramelized and burgers are medium-rare, about 4 minutes total. Heat remaining 1/2 tablespoon oil in a large nonstick skillet over medium-high heat until hot, then fry eggs. 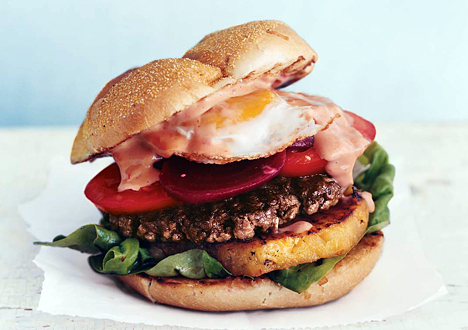 Spread chile mayonnaise on rolls, then assemble burgers with pineapple, beets, eggs, lettuce, and tomato. Rolls, pineapple, and burgers can be cooked in a hot oiled large (2-burner) ridged grill pan over medium-high heat.